Kenya Lopez is the CSUN AS Vice President and past recipient of the Dianne F. Harrison Leadership Award. 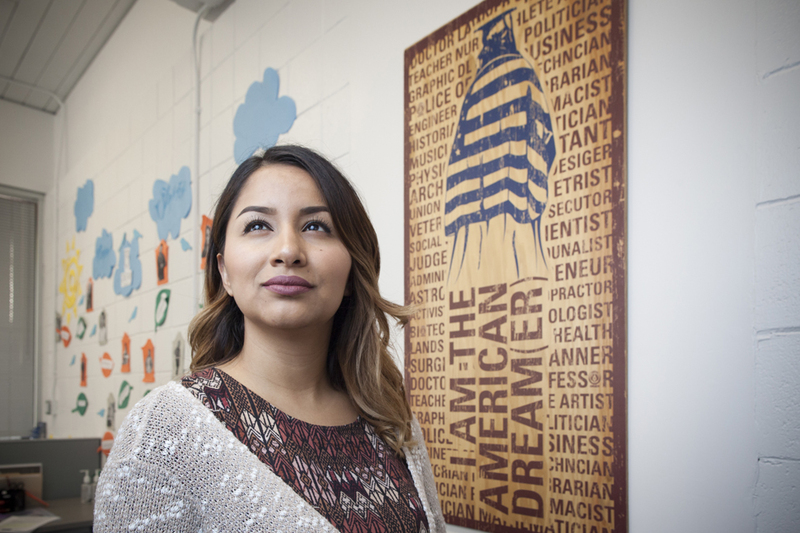 She's also a Dreamer, a term given to students in the U.S. with undocumented status. Kenya has excelled academically, and is one of many Dreamers who receive scholarships to help them fulfill their dreams of graduating from college. Photo by Lee Choo. Alumnus Omar Velasco and his wife Argelia Atilano form the duo for the top-rated radio program in Los Angeles, Omar y Argelia, on KLOVE 107.5 FM. Velasco has supported Dreamers through a scholarship that he developed. Photo by Lee Choo. 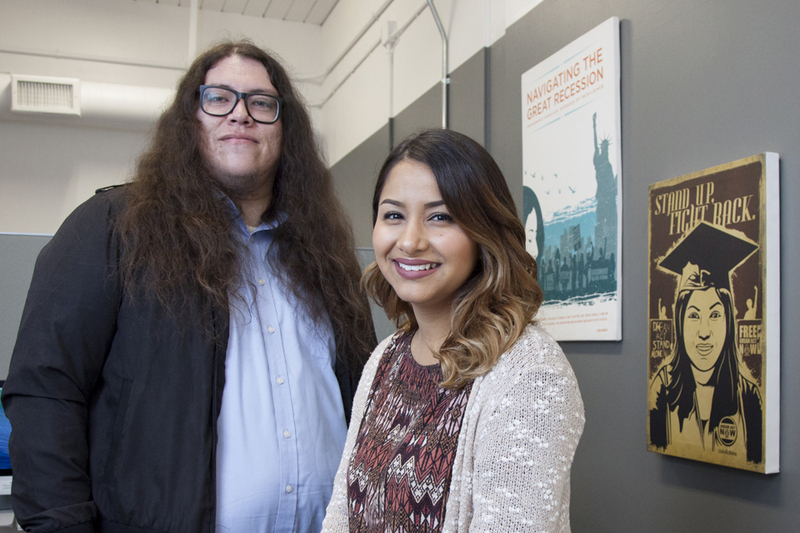 Dario Fernandez is the EOP DREAM Center coordinator, which offers a safe space for Dreamers like Kenya Lopez. Photo by Lee Choo. Kenya Lopez was just a couple weeks into her academic journey at California State University, Northridge when she sat in the audience during the 2014 Freshman Convocation on the Delmar T. Oviatt Library lawn. Like so many students at the outset of their college careers, Kenya was filled with ambition and anticipation for the challenge ahead of her. She was living the American Dream. Kenya looked up at the stage as Thelmari Raubenheimer accepted the Dianne F. Harrison Leadership Award, given annually to a CSUN student who has completed her or his freshman year and demonstrated leadership qualities in student government, a campus club or organization. Kenya perked up, inspired. Kenya was prescient. She did receive the Dianne F. Harrison Leadership Award the following year, in 2015, after surpassing all the benchmarks for consideration. For all intents and purposes, Kenya is living the American dream, with one twist in her story: Kenya Lopez has been living in the United States as an undocumented immigrant. The junior majoring in criminal justice and minoring in business law is one of an estimated 1,400 students attending CSUN with this status. Called the “Dreamers,” many of these young people came to the U.S. as children, with parents or other relatives who dreamed of starting a new life, a better life, in the United States. Most did not consider how their immigration status might affect them in the future. CSUN has a long history of supporting undocumented students through entities like the student organization, Dreams To Be Heard; the faculty and staff network of allies, Dreams Alliance; and the EOP DREAM Initiative that has established trained advisors in each of the colleges to assist Dreamers. On the CSUN campus, the Dreamers have the opportunity to pursue the typical college experience. But in the weeks following the most recent presidential election, during which immigration became a hot-button issue, many have stepped forward to share their stories about the positive work they are doing today and the hopes for success in their adopted homeland. Kenya came to the U.S. at age 11 with her mother from Guanajuato, Mexico, after Kenya’s aunt settled in Oxnard a year earlier. Kenya’s mother enrolled her in the fifth grade in a local public school, where Kenya initially struggled with the language barrier. It took just a year for her to achieve fluency in English, she said. That’s when her academic career took off. By the time she hit Rio Mesa High School, Kenya was a top student (she graduated in the top 10 percent of her senior class in 2014), and she participated in track, cheerleading and dance. Kenya had heard about the California Dream Act — which passed in October 2011 and now allows certain high school graduates with undocumented status to apply for state financial aid and scholarships from California universities and colleges. Kenya learned that CSUN had a Dreamers Scholarship for students like her, and she said that was a primary reason she applied. Two months into the first semester of her freshman year, she had earned her scholarship. These scholarships are important because undocumented students are not eligible for many federal financial aid options, such as Pell Grants. Some have received Deferred Action for Childhood Arrivals (DACA) designation. DACA was enacted in June 2012 to give young people arriving in the United States before their 16th birthday, who have not committed a major crime and are currently enrolled in school, a renewable two-year period of deferred action from deportation. These students can apply for a Social Security number, work permit and driver’s license. Undocumented individuals without DACA protection live without these rights and protections, yet many continue to pursue higher education. Most Dreamers are first-generation college students from working-class families, so in many cases, scholarships are what make college possible. Yet many do not know where to look for this aid. Undocumented students also have found scholarships and support at CSUN like the Education Opportunities Program (EOP), the DREAM (Dreamers, Resources, Empowerment, Advocacy and Mentorship) Project to help them succeed in college. Due to the high need, the project grew to what is now the EOP DREAM Center, where these students can obtain nuanced guidance, resources and support. Mario (a pseudonym to protect his anonymity) came to California at age 12 from the Philippines with his mother and brother in 2007. His father already had emigrated to and settled in the San Fernando Valley in 1999. His mother told Mario that they were going on a family trip to see his father and visit Disneyland. It was only after arriving that he found out that the U.S. would be his new home. It was Mario’s father’s employer who recommended that the children be enrolled in school, and he personally took Mario and his brother to register them for public school. Initially, Mario was placed in English as a Second Language (ESL) classes, but within a year, he had qualified for honors classes before finishing middle school. When he turned 18, Mario went to enlist with a military recruiter and was asked for his Social Security number. He said that he didn’t have one and was denied entry. A Dreamers Scholarship was followed by other aid to make staying in college and earning his degree a real possibility. Mario is majoring in public health with a minor in Asian American studies. After graduation, he’d like to help his community — in particular the undocumented community — access better health services. He also counsels undocumented students coming to the EOP DREAM Center about scholarship opportunities. CSUN alumni have recognized the need to help these students achieve the American dream of graduating from college, working professionally and finding success. Omar Velasco ’00 (Journalism) and his wife Argelia form the morning-radio tandem on K-LOVE 107.5 FM, Omar y Argelia, the top-rated morning show in Los Angeles in the Nielsen ratings for the past three consecutive months. Velasco’s father had come to the United States as a part of the Bracero Program in the 1950s, which gave rights to farm workers in the country illegally. Velasco was born in Jalisco, Mexico, before coming to his new homeland as a teenager. He enrolled in San Fernando High School and came to CSUN after graduation. He’s a U.S. citizen now and can empathize with the plight of the Dreamers. Velasco set up a scholarship for Dreamers coming to CSUN from his high school to help them get out of limbo. Julio Cesar Ortiz ’00 (Broadcast Journalism and Communications Studies Human Behavior) came to the United States sharing the same undocumented status as the Dreamers. He didn’t let the uncertainty of his future prospects deter him during his college career. About a year before graduation, he received a green card — later obtaining his U.S. citizenship — and since has launched a successful career as a TV news broadcaster for Univision, earning several Emmys and Golden Mike Awards. He’s also taught broadcast journalism at his alma mater for the past three years. Ortiz recalled a special work ethic he saw among the undocumented students. Ortiz has also funded a scholarship for Dreamers, hoping to help make a difference for young people who might otherwise not realize their full potential. “How can we not support talent that will strengthen our educational system, our community just because they lack a paper?” Ortiz asked. “I want to be that gasket that prevents a leak of talent from any university. I want to make sure that the next great member of our labor force or our community didn’t make it because they didn’t have money to buy books, or buy lunch or [find room and] boarding. Filiberto Gonzalez ’97 (Chicana/o Studies), the founder of Social Impact Consulting, which works with non-profits and local government to secure new funding sources, recently started a scholarship for Dreamers in honor of his mother, Elia Torres, who was a farm worker in Salinas, Calif. He recalled the heated environment in California surrounding immigration during his college years in the 1990s, and wanted to do something to help today’s students. The former chair of Movimiento Estudiantil Chicano de Aztlan (MEChA) saw undocumented students stand together in demonstrations to continue their rights to attend college. CSUN Dreamers continue despite their own respective vulnerable positions. They move forward individually and collectively as a group to support and assure one another that they will be able to one day put their CSUN degrees to work. Kenya is in student government as the Associated Students vice president. She has maintained top grades while working to represent nearly 40,000 CSUN students. One initiative she’s working on is close to home: a resolution to bring a legal clinic to campus that would focus on immigration. Her goal is to one day go to law school and work in immigration and civil rights law. Yet for now she has to move forward while hoping to one day earn U.S. citizenship herself. All the while she continues to be a source of motivation for other Dreamers. Kenya said that she has the email informing her of her first scholarship posted over her desk as motivation to keep working when she might otherwise call it a night. Other scholarships have followed, helping her keep her college dream a reality. She’s steadfast in her belief that the United States is her home, and wants to continue on to greater things in her adopted homeland. There are many stories similar to those of Kenya and Mario making their way through the EOP DREAM Center daily. Their struggle is real, and the help of the Dreamers Scholarship and the additional support from alumni like Velasco, Ortiz and Gonzalez lifts a financial burden and makes college a reality for these young people. “The biggest gift you can give anyone is an education because that opens doors,” Kenya said. “It’s beyond making a donation to CSUN. It’s really making a donation to a student who probably wouldn’t have made it through college without the scholarship. Anyone wishing to help fund scholarships for CSUN Dreamers can contact Jerry De Felice at (818) 677-3935 or can do an online donation at givenow.csun.edu.